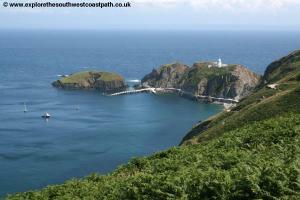 Although Lundy Island is not on the South West Coast Path, this island in the Bristol Channel 10 miles off the North Devon Coast is part of the coastline in Devon and has a costal path so is included here. 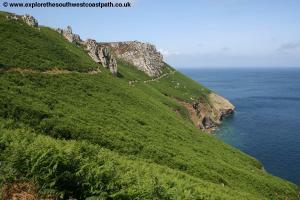 It is easily accessed by ferry from the North Devon coast. 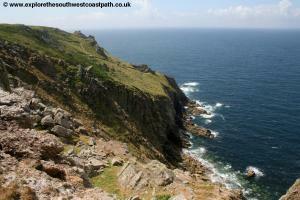 This walk is a circular walk all around the island, taking in some stunning coastal scenery. 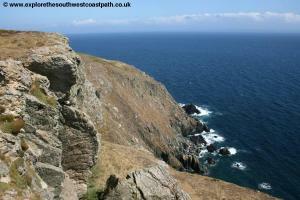 The island is also known for it's marine and bird life (including puffins) which you are also likely to see. 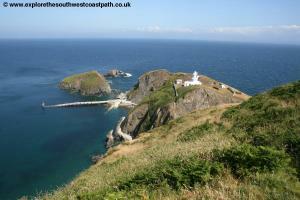 Lundy Island is in the Bristol Channel around 10 miles off the coast of North Devon. Only pedestrian access is available. Unless you want to stay on the island this trip is only really possible in the summer. During the summer months the MS Oldenburg ferry service sales from Ilfracombe and Bideford roughly 3 times a week. The timings of the boat allow a day trip to the island. Which port is used depends on the tide, as do the times of the sailing. The crossing takes around 2 hours from either port so consider the time you will have on the island when choosing a day and sailing (the boat makes only 1 crossing each day) as the sailing times vary. The boat holds around 200 people, but does get fully booked in the summer so it is worth booking in advance (at least a week). There is car parking at or near the ferry port in both Bideford and Ilfracombe and there are regular bus services to both ports to and from Barnstaple, from where there are rail services. The crossing from Ilfracombe or Bideford includes the landing charge. 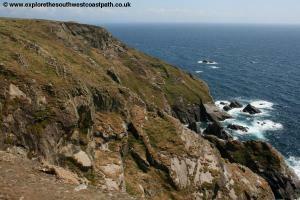 For details of the MS Oldenburg sailing times and prices see the Lundy Island website. An alterantive is to sail from Clovelly. Clovelly Charters sail from Clovelly during the summer months on board the Jessica Hettie although it is not a daily service so please call them on 01237 431405 to find the time and date of the next sailing. From Clovelly it takes a little over an hour to reach Lundy although be sure to bring a waterproof coat and trousers as the boat travels quickly with the result there is a lot of spray and so you will get wet. The Jessica Hettie has room for around 10 passengers and because it's a small boat the crossing can be a little rough. The advantage of choosing this crossing is that with a little over an hour crossing, along with the usual early morning departures and early evening arrivals back gives you a long time on the island (normally at least 5 hours). If you plan the trip on a day when the MS Oldenburg is not sailing you will find the island is much quieter as well increasing the chance of seeing more wildlife. 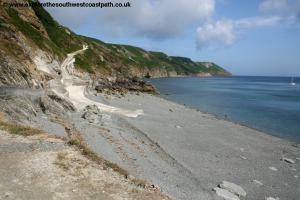 I crossed on the Jessica Hettie from Clovelly and I recommend this route. 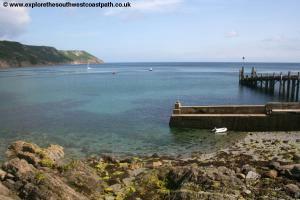 The skipper Clive will look after you very well and Clovelly is also a beautiful port to sail to and from. Be aware though that the hill from the parking place to the harbour is steep! If travelling from Clovelly if you are not a National Trust member you will have to pay a landing fee (currently £5) in the Marisco Tavern pub on the island if there is no one at the quay. During the winter months there is a helicopter service from Hartland Point but this is a lot more costly than the ferry and does not really allow for a day trip, you would need to stay on the island. 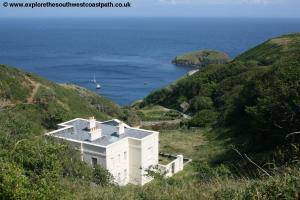 The Landmark Trust provide a large amount of accommodation on the island. They own a number of interesting properties, ranging from a light house to old school buildings which you can rent all year round. The buildings you can rent range from sleeping 1 person to 14 and with a range of prices. There is also a camp site on the island, open in the summer only. 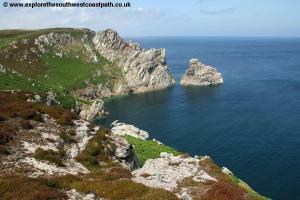 For details see the Lundy Island website or call 01628 825925. If you are not staying on the island there are a large number of bed and breakfast and hotels in Bideford or Ilfracombe and other towns nearby. In Clovelly there are a couple of hotels, with the Red Lion being closest to the harbour (it is on the harbour wall). On arrival at the island you will land on the pier on the landing beach. From here follow the track (road) up the hill. 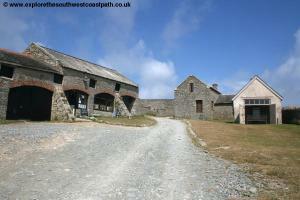 Lundy Island is owned by the National Trust but leased to the Landmark Trust who run the island on a day-to-day basis. 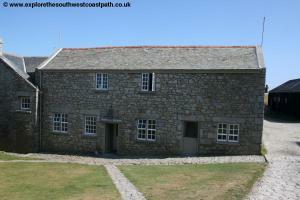 The Landmark Trust has restored many of the buildings on the island and leases them out for holidays (there is also a campsite on the island). Soon you pass one of the properties, Millcombe House having taken the winding main track through a small area of woodland. Always keep to the wider path (road) until you reach the centre of the village on the island. Here you will find the islands pub, the Marisco Tavern. It is worth picking up the free map of the island here, it shows the buildings and main paths. This square also includes a shop, selling souvernies and groceries (for those staying on the island). You can also buy some of the unique island stamps to send a post card from here. There is an information display in one of the buildings and toilets here. 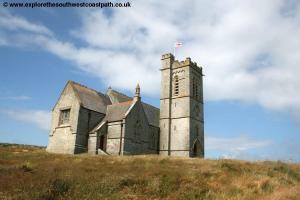 It is also well worth stopping to see the church, it is a lovely old church. If you did not arrive on the MS Oldernburg and are not a National Trust member then you will need to pay your landing charge in the Marisco Tavern. The island is (with a few exceptions) open access so you can walk where you choose although to prevent erosion it is strongly recommended to stick to the existing paths if you possibly can. From the main street pass the shop and farm buildings and then turn left just after the last building on the path along the field edge through the gates. Keep going heading for the old light house. Lundy, being in the middle of the Bristol Channel has always been a hazard to shipping. To prevent the numerous wrecks it was agreed to build a light house on the island which is the light house you now see ahead. However due to the sea mists that often cover the island the light house proved ineffective as it was often obscured by the mist. Therefore two new light houses were constructed by Trinity House one at the north of the island and another at the south which you would likely have seen when arriving on the island at the landing beach. These light houses, being positioned lower down reduce the problems of sea mist. These are now owned and maintained by Trinity House. 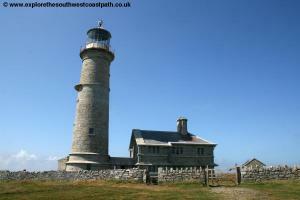 The old light house is now a holiday property that can be rented out. 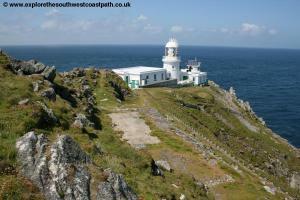 Pass the old lighthouse and you continue until you reach the coastal path around the island. This is a very specatacular coastline with the west facing coast taking the full force of the Atlantic. 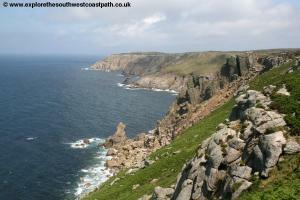 The high cliffs and headlands offer wonderful views. 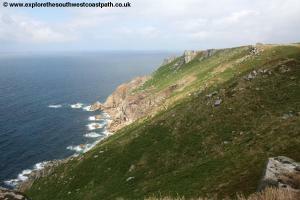 Turn right and follow the coast path further north. 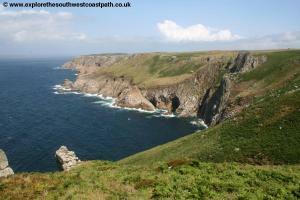 At each of the headland you may choose to walk out to enjoy the fantastic views. 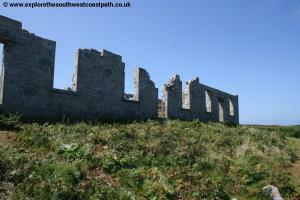 Soon you come to the headland with the old battery on and ruined houses that can be seen near the base of the cliffs. 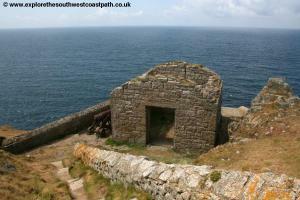 It is worth taking the path down to the old battery, you can now walk around it and explore some of the other ruined buildings. There is also a good view from the end of the path. 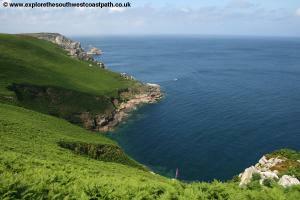 Re-trace your steps back up to the main coast path and turn left, heading north. You cross the stone wall, Quarter Wall. There are three walls on the island, called quarter wall, halfway wall and threequarter wall, for obvious reasons. Ahead is a wide bay and then you come to the next hadland above Dead Cow Bay one of the most beautiful parts of the island. 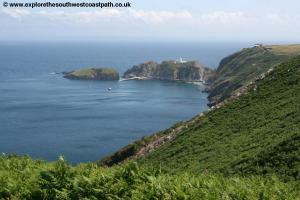 This bay is one of the places you are most likely to see the islands famous puffins. Sadly there are only a few breeding pairs on the island now, but if you are lucky you may see one. There are many other sea birds to be seen here as well. Keep north and the path descends down to Punchbowl Valley where there is a little stream flowing from Poundsbury pond just a little inland. The path can be boggy here so care is needed. Keep north into Jennys Cove. 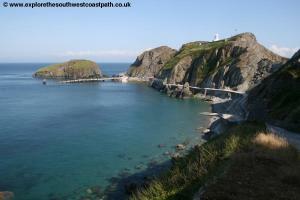 This is another good place to see Puffins. 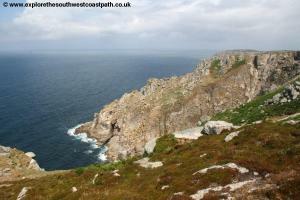 Continue north along the coast path, crossing a few streams where again the path is boggy. 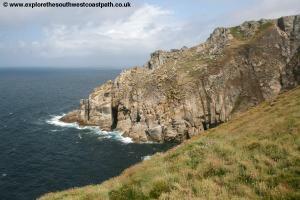 Keep north along the main coast path passing the bay of St James' stone. 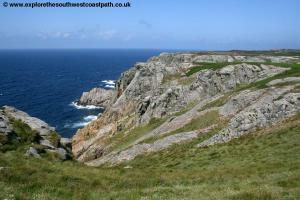 The northern part of the island is heathland with a covering of heather and is particularly attractive in the summer. 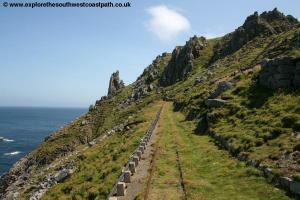 Follow the path north still until it joins the main wide track leading to the lighthouse. The views from around the lighthouse are particularly good and on a clear day when looking north you can also see the coast of Wales. From here you initially have to follow the main path back but when you find a smaller path off to the left, take it and then follow the narrow minor path along the east part of the coast. 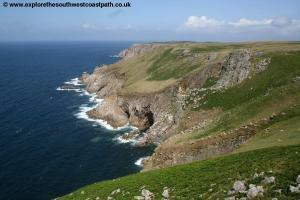 Gannets Bay, the first bay is sheltered and a good place to see seals. The waters off the island are protected and so have a wide range of marine life. 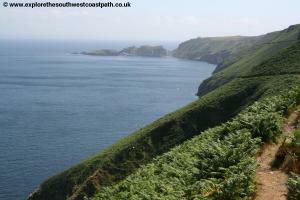 The eastern coast, being more sheltered has more plant coverage (mostly bracken) and the sea is typically less rough. 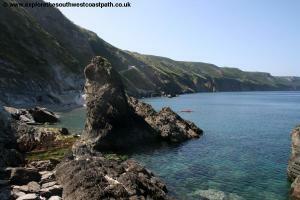 Keep south along the coast path passing Threequarter Wall and Threequarter Wall bay. 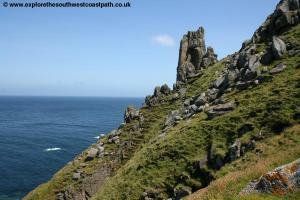 Soon you pass Tibetts Point and Gull rock. 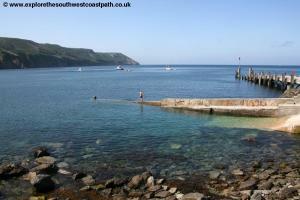 Keep heading south on the coast path passing halfway wall above the attractive halfway bay. Keep south on the coast path to the Quarry Beach. As you might expect inland is an old quarry with a little memorial and the remains of the old minging cottages. 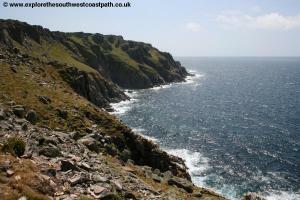 Keep goinng south passing quarterwall bay and the beaches of the east coast. 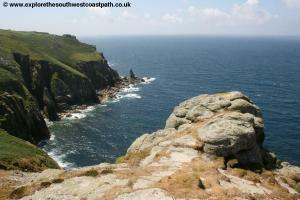 Ahead you have a lovely view of the beautiful coast around the landing point. Soon you come to the old school house and from here re-trace your steps back to the village. 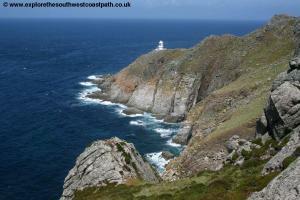 Return to the old light house and now turn left to take in the south west corner of the island. 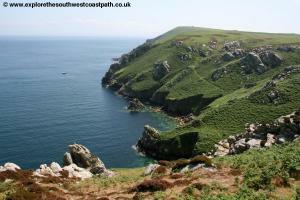 Turn left on reaching the coast and keep to the coast path passing Pilots Quay and Goat Island, a specatacular part of the rugged west coast. 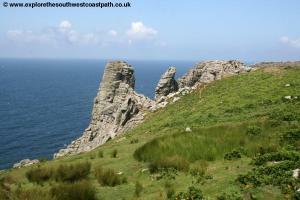 Soon you reach the South West point of the island, Shutter Rock. 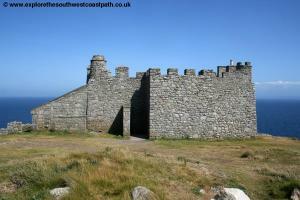 Keep to the coast path as it turns right past the old castle (another holiday property) and then return on the path past the church to the village on the island where the walk ends. 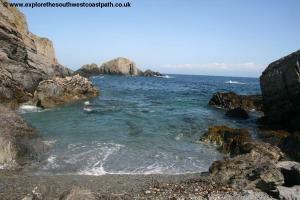 If returning by boat it is worth also going to the south beach behind the jetty, this is a sheltered little cove. Lundy is a lovely peacuful island with some stunning scenery and you will have seen some of the best scenery of the island on this round the island walk. Return to the main land by ferry in the summer months or helicopter in the winter. Here are some photos of the walk. Click each picture for a larger version and description. Ordnance Survey Explorer map 139 covers this area of the coast path and is available from most book shops nationwide and many local shops, including at Clovelly and Hartland. The detail on the map of the island however is not great, the free map available on the island provides more detail. 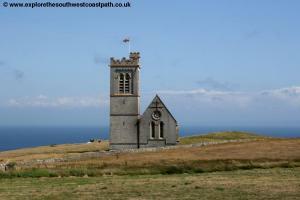 Streetmap is a web site which provides maps of the UK, including Lundy Island. The links below cover the whole island.